Latino youth protesting the separation of families at the southern border. – picture taken in front of the Capital. 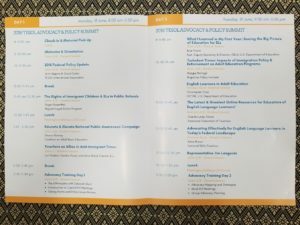 On June 18 – 20, 2018 Rachel Casey, our Southwest Regional Liaison, and I, Sam Ouk, MinneTESOL President, participated in the TESOL Advocacy and Policy Summit. Different TESOL affiliates made up of 91 people from 33 different states plus the District of Columbia and Puerto Rico came together to advocate for English Learner adults and children by educating senators and representatives about the needs of our students and how good and bad policies can affect them. 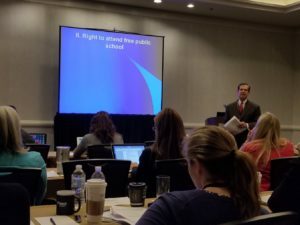 The program featured two full days of issue briefings and activities around education activities relating to the profession of ESL and advocacy. The third day consists of our team of advocates heading to Capitol Hill to meet with our Senators and Representatives. 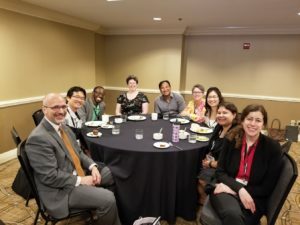 This year, the timeline of the TESOL Advocacy and Policy Summit coincided with the debate around separating children from families at the Southern border. 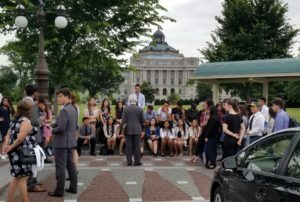 Therefore, on top of advocating for full funding of federal dollars towards ESL and pushing policies that promote language learning for our students, this year also had a strong emphasis on advocating for our immigrant students and families and combating the negative agendas that hurt them. Roger Rosenthal briefing TESOL members on the rights of Immigrant Youth – Regardless of undocumented status, public schools may not deny the admission of immigrant students. 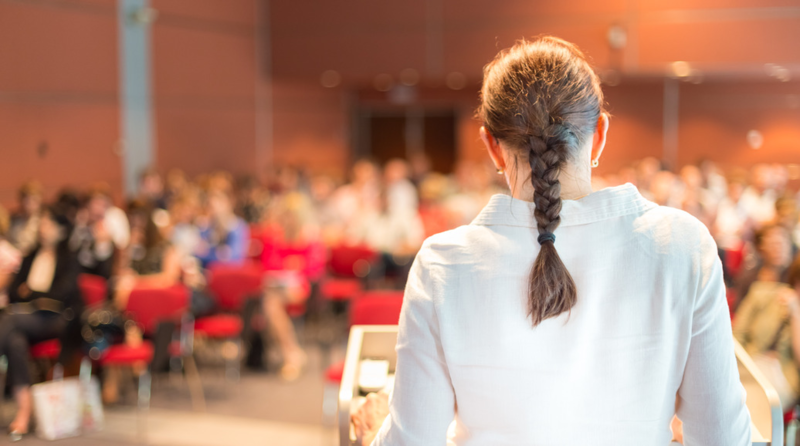 TESOL International, as an organization was phenomenal in putting together sessions to educate their affiliates on a wide range of policies and legislation affecting English Learners in a short amount of time. During the first two days of the session we were informed about the funding discussions around Title I, II and III, the Reaching English Learners Act, authored by Rep. Langevin of Rhode Island, updates around the DACA debate, and the federal discussions around adult English Learners and Pre-K through 12 education which included the possible restructuring of the Office of English Language Acquisition (OELA) which brought many concerns to TESOL and its affiliates. TESOL leaders briefed us that there have been talks to eliminate the position of Director of OELA and move the office under the bigger Office of Elementary and Secondary Education (OESE). TESOL International along with 17 other organizations representing teachers and administrators expressed great concerns around the idea to restructure OELA under OESE. In a letter to Betsy Devos, they outlined two reasons why the move would negatively impact the field of English Language Acquisition. 1) Restructuring would diminish the time and attention needed for English Learners. 2) Restructuring may lower the importance placed on English Learners in the eyes of local education districts. Christopher Powers, the Executive Director of TESOL also expressed these concerns along with offering the recommendation on behalf of TESOL for Secretary Devos to maintain the current OELA profile to include a full-time director along with a deputy director reporting directly to the secretary and relocate Title III back under OELA as a recent shift moved the management of Title III funding to OESE. Enjoying lunch with Christopher Powers, E.D. TESOL International and TESOL Affiliates from Pennsylvania and Maryland. It is not an understatement to say that there are many difficult issues to work through in our field as it relates to the politics of our nation. However, one bright spot is the proposed legislation put forth by Representative Langevin of Rhode Island. His bill, The Reaching English Learners Act will help institutions of higher education across the state prepare the next generation of ESL teachers by providing grants for colleges and universities to train and develop future EL teachers. This will help address the shortage of EL teachers across our state and the nation. With the information provided by MinneTESOL and the research that Rachel and I did about the specific needs of Minnesota’s English Learner population, we headed to Capitol Hill on our third day to speak to the legislative staff in the offices of Senator Smith and Klobuchar and the legislative staff of Representative Emmer, Lewis and Walz. We asked the legislatures to support the full funding of Title I at the amount of $15.8 billion, Title II at $2.3 billion including $664.5 million for The Workforce Innovation and Opportunity Act (WIOA) and $785 million for Title III. 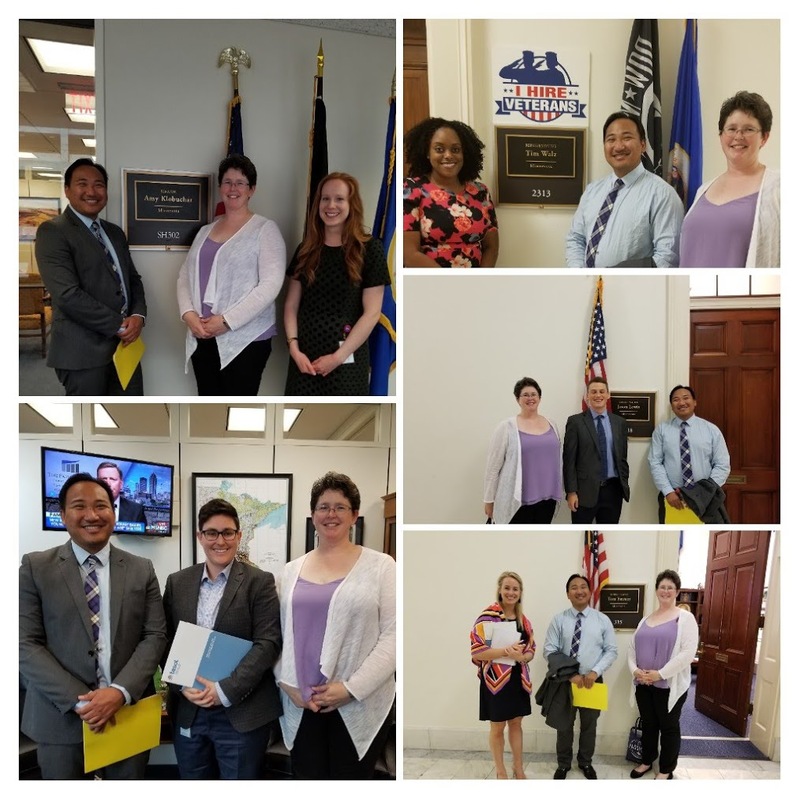 We asked them to support Rep. Langevin’s bill, Reaching English Learners Act (H.R.4838) and ensure that the Office of English Language Acquisition does not get moved under the Office of Elementary and Secondary Education. Furthermore, we expressed deep concerns of what was happening to our immigrant and refugee children and highlighted all the benefits that our students and their families have contributed to our communities. We invited all Senators and Representatives to join us at our 2018 MELED conference. Rachel and I created a one page summary describing our professional work and the passion we have for our students to include with TESOL Materials for each Congressmen. We encourage all the congressmen to reach out to us and continue the dialogue with MinneTESOL around the needs of our English Learners. At the end of the Summit, Rachel and I came away with a renewed sense of urgency to speak out on behalf our students. Never in my life, filled with battles on behalf of immigrants and English Learners, do I feel such a dire need to advocate. 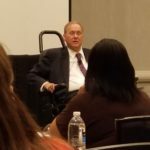 There are pockets of bright spots such as continued funding of Title I, II, and III and the Bill put out by Representative Langevin. However, many proposals being discussed by the current administration could and have already hurt many of our EL students and their families, along with the profession of English as a Second Language. I will plan to attend the summit again next year and I would encourage more MinneTESOL members to attend. Furthermore, I would encourage our members to continue to find ways to advocate and educate our colleagues around the needs of our students. Thank you MinneTESOL for this opportunity!